Spring Street is the backbone of what locals refer to as "The Loop," the circular route that travels past many of Eureka's springs and through the Historic District, a Victorian Village so perfectly preserved that the entire town is on the National Register of Historic Places. On Spring Street, the mood is eclectic, the architecture is Victorian, the patrons are diverse and the cuisine is served with an international flair. Spring Street is populated by galleries, shops, nightclubs, coffee houses, quirky local hangouts, elegant gourmet restaurants, gardens, massage therapists, healers of various sorts, street musicians, artists, and starry-eyed lovers. (See Photos of the real thing). Send the kids out to play on the Highway! 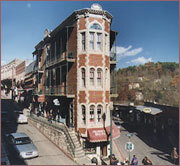 Highway 62 is the Main Drag of the Eureka Springs Attraction District. "The Highway" in Eureka Springs means US Hwy 62 or US Hwy 23 or Kingshighway, (which is really Hwy 62), all virtually indistinguishable to the untrained eye. Remember: "Left" & "Right" do not exist as directions in Eureka. We only go "Up" and "Down." On the Highway, the atmosphere is wholesome, the cuisine is family style and down-home Southern, and the sounds of country and gospel music fill the air. 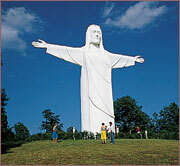 The Highway is the home of Eureka Springs' attractions--music shows, the Passion Play, architectural marvels, botanical gardens, caves, lakes, museums, wild animals, giant dinosaurs and exotic birds. (See Photos of the real thing).